Rockers the Rolling Stones used giant lips as their trademark, so what better way to proudly display your musical credentials than with a portable speaker shaped like a lover’s buccal embrace? Brando's Lips Speaker: perfect for your iPod? 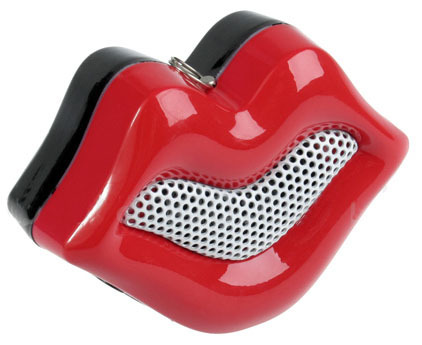 The USB Mini Lips Speaker, from online retailer Brando, measures about 60 x 25 x 45mm and has a 35mm3.5mm jack for connecting it to a wide array of audio sources, including iPods and mobile phones. A USB-to-3.5mm headphone jack is also supplied for devices without a standard headphone port. With a maximum output of 2W this lippy loudspeaker won’t burst your eardrums, but the supplied neck strap means it’s portable. An on/off switch lets you conserve the speaker’s internal battery, which can be charged by USB, and an LED light on the lip’s underside shows you it's working, even if the volume's turned down. Brando’s speaker would be the perfect accessory for a concept handset, dubbed KissPhone. The phone requires one user to kiss its physical lips so that it can replicate the same pressure, temperature and sucking force on another person’s KissPhone. If you’re a loved-up listener then Brando’s USB Mini Lips Speaker is available online now for $14 (£7/€10).